There are a two primary ways to install commercial bike racks. Either in-ground or surface mount. The specific installation method will then largely be dictated by the surface where the bike rack will be mounted. It's important to determine the desired installation method when selecting a commercial bike rack as it affects the bike rack you receive. For example, in-ground bike racks have longer leg posts to account for the section that will be encased in concrete. Surface mount bike racks have flanges at the end of the leg posts. They would also be too short to use if mounted in ground. In this post, we’ll look at each of these installation methods in more detail. As well as provide step-by-step instructions for each. Note: The information in this post is meant to provide a general understanding of common installation methods for commercial bike racks. Please refer to the documentation that accompanies your product or local codes for specific installation instructions. In general, in-ground installation of bike racks involves creating a hole in the surface where the leg(s) will be placed, inserting the leg(s) and then encasing the leg(s) in concrete. Most often, an in-ground mounting method would be chosen when placing the bike rack in an area where an existing concrete slab does not exist. Like natural soil surfaces, for example. It is one of the most permanent and tamper-resistant mounting methods. 1. Prepare a hole for each leg of the rack that is to be mounted. Generally, the hole should be 6 inches in diameter at a minimum. Refer to the manufacturer’s installation instructions for specific hole size needed. The hole will then need to be dug to a depth mandated by local codes. Below the appropriate frost level depth of the climate at a minimum. 2. Insert the anchor rods provided by the manufacturer into the holes at the bottom of the leg(s). NOTE: If the fixture includes a grout cover, slide high up on the leg. And temporarily tape it so it is out of the way. 3. Insert the leg(s) into the hole(s). See the instructions of your product for the specific mounting depth. 4. Suspend the fixture on a frame or other object to properly plumb and orient the legs in the hole. 5. Pour the concrete into the hole(s). Allow to set. A surface mount installation involves drilling holes into an existing concrete slab. Anchors are then inserted into the drilled holes in the concrete. Bolts extend from the anchors above the concrete and are placed through a hole in the flange attached to the leg of the bike rack. Nuts are then used to fasten the flange to the surface. A surface mount installation is preferred when installing site furnishings on existing concrete surfaces. The specific surface mount installation method you use will be determined by the anchor type you select. There are three common anchors used with surface mount installations – wedge, drop-in and spike. The primary differentiation for when each anchor should be used is based on the permanence of the installation and the surface material. A wedge anchor is a single element that is inserted into the hole in the concrete with the male, threaded portion extending above the concrete. A nut is used to tighten the fixture to the surface. This installation method is best used with solid concrete surfaces. When using wedge anchors to install bike racks, it is recommended tamper-proof nuts be used. A standard nut on a wedge anchor can easily be removed by thieves with common hand tools. The bike rack can then be lifted and the bike lock slid off the rack. Leaving the bicycle vulnerable to theft. 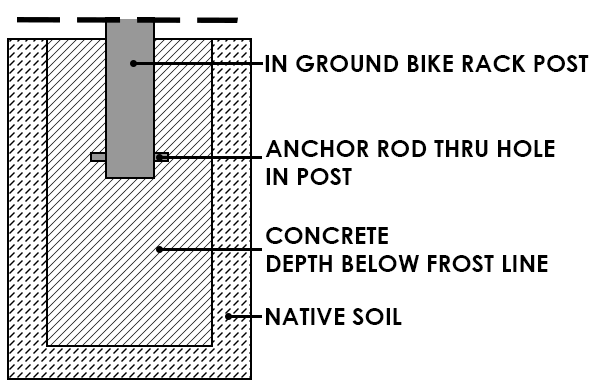 If the bike will be removed in the future and the anchor will no longer be needed, the portion of the wedge anchor above the concrete can be sawed off. The wedge anchor can also be pounded into the concrete. But the hole will need to be drilled two times the length of the anchor before installing the wedge anchor. 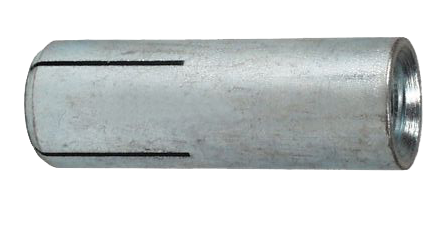 A drop-in anchor involves an anchor element that is placed into a hole that has been drilled in the concrete. A separate bolt is then inserted into the anchor that expands the and sets the anchor. A nut is used to tighten the fixture to the surface. Tamper-proof nuts should again be used with this style of anchor. This installation would be preferred when the surface material is solid concrete or concrete block. It’s also more advantageous if the bike rack will be removed. 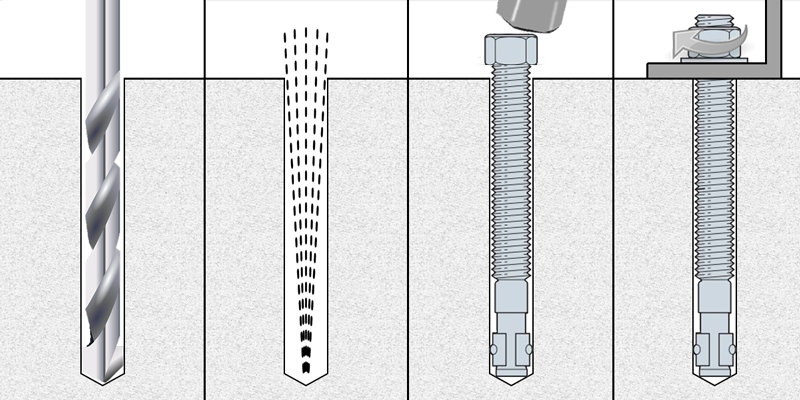 The bolt simply unscrews from the anchor, which is level with the material. Leaving a flat surface. A spike anchor is a single, solid object inserted through the flange on the bike rack and into the drilled hole in the concrete. Because of its shape, it remains lodged in the concrete. This installation works best with solid concrete surfaces. This anchor is much more difficult to remove. The concrete surrounding the anchor will need to be chipped away to remove and uninstall the bike rack. It's what makes this installation method almost as secure as in-ground mounts. 1. Determine correct wedge anchor length. Do this by adding minimum embedment depth – defined by the diameter of the wedge anchor being used – and material thickness of flange on site furnishing footing. 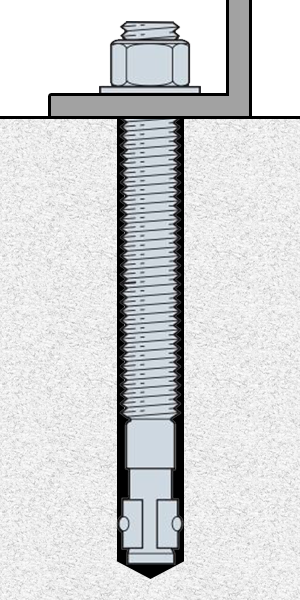 For example, a 3/8” wedge anchor with a minimum embedment depth of 1-1/4” should be drilled 1-5/8” at a minimum. It’s suggested the hole actually be drilled an additional 1” to account for dust that will settle into the hole. Or double the anchor length to allow the option for the anchor to be pounded fully into the hole. 2. Place bike rack in the desired installation spot. Mark locations of holes by marking through the mounting holes in the flange. 3. Remove bike rack from installation spot. 4. Drill holes using drill bit the same diameter as wedge anchor. 5. Blow out or remove as much concrete dust from the hole as possible. 6. Insert wedge anchors into the holes in the concrete. 7. Place nut on wedge anchor to protect threads during installation. 8. Hammer wedge anchor into hole deep enough so that threads are below surface of base material. 10. Place bike rack back in desired location, threading anchor through holes in flanges. 11. Place washer on anchors, then nuts. Tighten nuts turning approximately three or four full turns. 1. Place bike rack in the desired installation spot. Mark locations of holes by marking through the mounting holes in the flange. 2. Remove bike rack from installation spot. 3. Drill holes using a 3/4" drill bit for a 1/2" anchor. Or a 5/8” drill bit for a 3/8” anchor. CAUTION: Oversized holes will make it difficult to set the anchor and will reduce the anchor's load capacity. 4. Blow out or remove as much concrete dust from the hole as possible. 5. Insert cone end of anchor into hole and tap flush to surface. 6. Place bike rack back in desired location. Insert bolt through holes in flanges and into anchor. Note: The anchor should engage a minimum of 2/3 of the bolt threads. 7. Place nut on bolt and tighten. The anchor can also be expanded using a Hollow-Set Tool. If Hollow-Set Tool is used, thread anchor onto tool prior to tapping into anchor hole. When flush with surface, turn tool clockwise to tighten. Release tool from set anchor by turning counterclockwise. Fixture can then be attached. Note: Always make sure to wear appropriate safety equipment and following any safety instructions from manufacturer when installing anchors. Still have questions? Use the chat on this page (during regular business hours) to start talking with a Madrax team member. Or click here to fill out our contact us form and we'll do our best to respond in one business day.